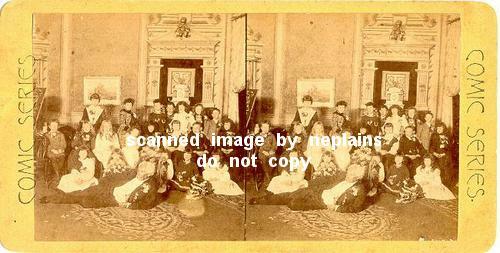 Group of children and two women posing for the photo. Nicely dressed man on the floor in front of the children and leaning on his elbow. Occasion unknown, but appears to be some type of celebration. Size 7" x 3-1/2". Flat, pale yellow mount with rounded corners. Light grey blank verso. Light corner and edge wear. Minor scuffs on photos and on mount. 1/4" faded spot at lower right corner of left photo.